"I heard that too. Yeah right. Anyway..."
That was Slash's reaction to the news of MusicRadar's recent poll that found fans want Axl Rose to join Velvet Revolver. Slash took time out to speak with MusicRadar to coincide with his latest signature Gibson and Epiphone six-strings being unleashed on the world. And Slash loves Les Pauls. That's for sure: "I've got somewhere between 80 and 90 guitars and I'd say 75 percent of them are Les Pauls. It's ridiculous - but they all have a unique purpose." Click here to get the skinny on everything from his forthcoming solo album, to how he's been affected by the European smoking ban, to his favourite hat-wearing rock stars. 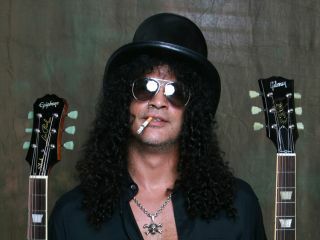 Slash: The MusicRadar Interview. Read it here.